Mechanical properties of materials often vary considerably when in their normal fluid environment compared to the usual laboratory dry testing conditions. Probing the mechanical properties of biological samples in fluid media should prove a closer mimic of in vivo conditions than conventional dry nanoindentation testing. The testing capability of the NanoTest has been extended by the development of a liquid cell allowing nanoindentation, nano-scratch & wear testing of samples fully immersed in liquid. 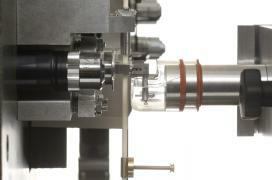 A friction transducer extension also allows immersed sample friction measurements. 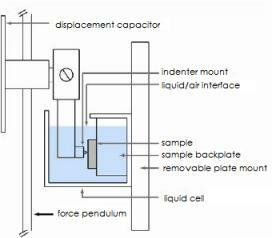 The fluid cell works with the existing pendulum design and the horizontal loading has several key advantages for testing in fluid. 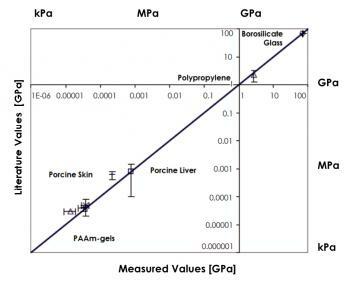 Figure 3 shows the measured Elastic modulii of various specimens (Borosilicate glass, Polypropylene, Porcine liver, Porcine skin, PAAm-gels in various mol concentrations) are in very good agreement with literature values. The data ranges eight orders of magnitude. Research by MIT has shown that nanoindentation with the NanoTest liquid cell could be performed with sample fully immersed in liquid for materials spanning several orders of magnitude of stiffness from highly compliant gels to biological tissues.